The swift tower near the Pacific Boulevard viaduct at dusk on Sunday, Sept. 17. Migrating swifts have been spending nights in various Albany chimneys, according to people who have seen them, but not in the structure especially built for them a year ago. 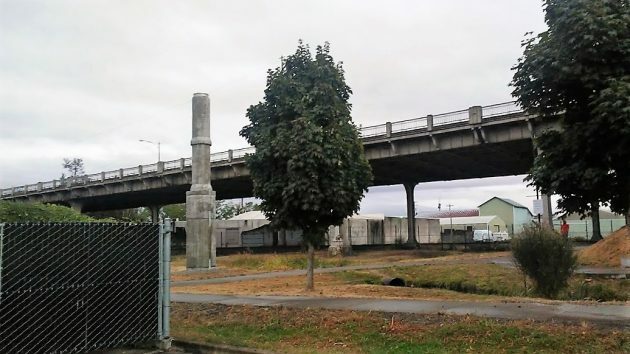 It was last August when members of the Audubon Society, working with Albany city agencies and private companies, used sections of concrete culverts to build the 30-foot tower between the Swanson Park pool and the Pacific Boulevard viaduct. It was intended to replace, as a potential roost for Vaux’s swifts, a chimney three blocks away that disappeared with the demolition of the old Fire Station 11. Wondering if the experiment had worked, if swifts in fact had roosted in the tube since it was built, I took a look one evening last week and again at dusk on Sunday night. No swifts, as far as I could tell. So I checked with Jim Fairchild of the Audubon chapter in Corvallis. “The swifts have not been reported using the created structure yet,” Fairchild told me in an email this morning. But he passed on sightings elsewhere, including one reported by Albany resident Jeff Fleischer at about 7:30 on Sunday night at a house at 637 Fifth Ave. S.W., next to the Albany-Santiam Canal. Fairchild says Albany apparently has several suitable roosts for the little birds during their fall and spring migrations. He mentioned one, a pair of chimneys behind Bolts and Blocks, the quilting-supply shop at Second Avenue and Broadalbin. “The large population coming through seems content to use a number of suitable structures now rather than the large unknown we hoped to offer,” he wrote. The swift tower before sunset one evening last week. No birds then, either. Great reporting Hasso. Will be cool if they do use it. As I love next door to Jeff, he pointed out to me last night all the swifts circling and shifting above our neighborhood as they looked for a place to roost. Pretty cool. I applaud the people who built that structure. Reminds me of the wonderment of youth, when people first find nature fascinating. I’ve watched a lot bird activity tonight. They seem excited or exorcised by the change in weather. It is interesting to watch them fly in clusters. Dart and dash. Fly and abruptly adjust. 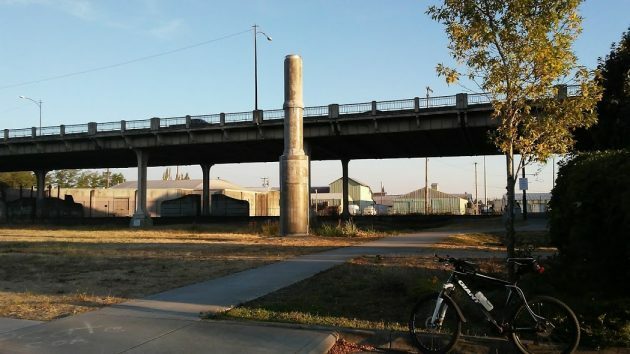 Did those who installed the new “chimney” stop to think about spending some time charring the inside of the tubes? Maybe a good coat of soot would draw them in. We were fortunate enough to be in Hot Springs, Arkansas one year when they made their appearance. What a sight!!!!! I watched a bunch go into a chimney in the historic house just south of Bill’s Flower Tree last night. Fun show. Yay for historic houses with neat old chimneys.